Once the wind farm constraints are defined, the layout of the wind farm can be optimised. This process is also called wind farm ‘micrositing’. As noted above, the aim of such a process is to maximise the energy production of the wind farm whilst minimising the infrastructure and operating costs. For most projects, the economics are substantially more sensitive to changes in energy production than infrastructure costs. It is therefore appropriate to use energy production as the dominant layout design parameter. The detailed design of the wind farm is facilitated by the use of Wind Farm Design Tools (WFDT). There are several that are commercially available, and others that are research tools. Once an appropriate analysis of the wind regime at the site has been undertaken, a model is set up that can be used to design the layout, predict the energy production of the wind farm, and address issues such as visual influence and noise. For large wind farms it is often difficult to manually derive the most productive layout. For such sites a computational optimisation using a WFDT may result in substantial gains in predicted energy production. Even a 1 per cent gain in energy production from improved micrositing is worthwhile, as it may be achieved at no increase in capital cost. The computational optimisation process will usually involve many thousands of iterations and can include noise and visual constraints. WFDTs conveniently allow many permutations of wind farm size, turbine type, hub height and layout to be considered quickly and efficiently, increasing the likelihood that an optimal project will result. Financial models may be linked to the tool so that returns from different options can be directly calculated, further streamlining the development decision-making process. An example screen dump from a typical WFDT is presented in Figure 4.1. 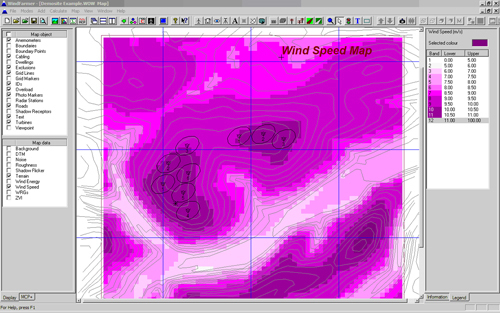 The darker shaded areas represent the areas of highest wind speed. The turbines are represented by the small markers with a number underneath. The spacing constraint is illustrated by the ellipses (this constraint is discussed in the turbine loads section).